US and Moroccan soldiers during African Lion 2019. As African Lion 2019 comes to an end, so does the era of U.S. Marine Corps Forces Europe and Africa’s tenure of serving at the helm for the multinational exercise. “For the past 16 years, U.S. Marine Corps Forces Europe and Africa has been planning and conducting African Lion alongside our Moroccan partners, with Tunisia joining the exercise three years ago,” said Maj. Gen. Roger Cloutier, the U.S. Army Africa commanding general. Cloutier continued as he addressed a multinational audience at a training location in Agadir. African Lion 2019 kicked off in earnest with a weeklong academic tune-up in preparation for the March 25 start date that comprised two weeks of field training events, live fire ranges, command post exercises and humanitarian civic activities. This year’s multi-domain exercise consisted of more than 2,000 international participants – the largest iteration of African Lion to date. 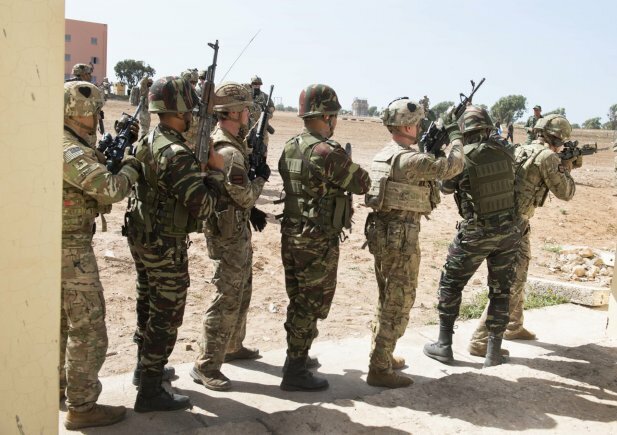 Service members from Morocco, Tunisia, Senegal, the United Kingdom, Spain, France, Canada and the United States worked side-by-side, forging bonds and strengthening partnerships. Another key participant during the exercise was the 151st Medical Group based out of Utah, consisting of medical practitioners from Utah, as well as health care providers from California, Arizona and Colorado. Once they arrived to Agadir, Morocco, they teamed up with Moroccan and Tunisian providers at a field hospital tent in a remote area of Tata. Upon opening their doors, their beds were quickly filled by the local populace seeking medical and dental care. The scope of African Lion provided an opportunity for all participating units and nations to enhance readiness by performing their mission essential functions. While USARAF primarily focused on overseeing operations and allocating resources as U.S. Africa Command’s combined joint task force headquarters, it also captured best practices to set favorable conditions for African Lion 2020. Although this year’s exercise just wrapped up, planning for African Lion 2020 is already underway. “As we look to next year’s iteration, we’re working closely with our partner nations to create a shared vision that promotes mutual training objectives and gets after core competencies,” Cloutier said. “The bar has been set high, but we’re ready. Army Africa is going to take this hand-off from the Marines and keep moving the ball down the field,” Cloutier added.